Naomi Everett is in charge of the Lucy Cuddy cafeteria at UAA. She had just begun her work day when Friday’s earthquake hit Anchorage. Shortly after the initial shock, students and staff quickly assessed the damage. Classes were canceled that day. UAA Chancellor Cathy Sandeen says it only took a couple hours for cleanup crews and engineers to start inspecting the campus. She says one of the inspectors was a UAA graduate. The engineering team determined that no major structural damage or gas leaks took place on campus. The university’s incident response team gathered and began the cleanup process. Ryan Buchholdt was in charge of the University’s response team. He says the main priorities were getting fire suppression back online, as well as making sure student housing was safe and livable. 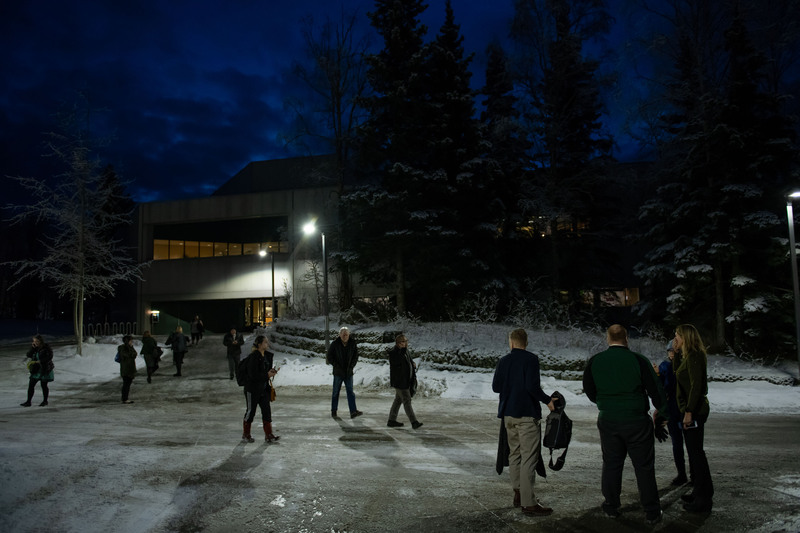 UAA power and internet wasn’t down for very long, so university officials were able to send out notices pretty quickly about the closure and what the next steps were. For Buchholdt, once the university’s internal safety measures were stabilized, the next priority for the teams was getting teaching areas cleaned up and ready for use. He says the teams worked through the weekend in shifts that went from 10 to 12 hours, sometimes longer. Not all of the campus has been cleared out and some areas are still blocked off, but enough work has been done to resume classes. Chancellor Sandeen says that the university was lucky that the whole process went as smoothly as it did. Sandeen says that as far as costs go, the university has reserve funds for emergencies, but they also have insurance and have been cataloging the damage to apply for federal relief. She says the university plans to discuss how to prepare even better for a future emergency. As for Everett in the culinary department, she and her team have been cleaning, disinfecting and sorting the kitchen areas, making sure that they’re ready for students. She says they lost about a quarter of their dishes, and have taken a small step to ensure the numbers are lower in the case of another emergency. UAA classes in the Chugiak-Eagle River campus have been relocated to the Anchorage campus while building damage is assessed there. Buchholdt with UAA maintenance says that campus is owned by a separate entity that is handling that damage. For the time being Eagle River students will finish their classes this semester at the Anchorage campus. Anchorage School District students who attend the Chugiak-Eagle River branch of Alaska Middle College, which is operated in partnership between with the district and UAA, will also be relocated.